Wildlife experts lose one to two black rhinoceros each year from anesthesia complications when they capture and relocate the animals. That's one to two percent of the black rhinos that are moved annually, but with only 5,000 or so left in the wild in southern Africa, any losses are too many. A new Cornell-led study of black rhinos in Namibia finds that positioning the large animals on their bellies as opposed to their sides helps them breathe more efficiently during anesthesia, a finding that promises to limit unnecessary deaths. "We are trying to improve the success of rhino capture and translocation," said Robin Radcliffe, adjunct professor of wildlife and conservation medicine at the College of Veterinary Medicine, and first author of a paper published in the June issue of the Journal of Zoo and Wildlife Medicine. Robin Gleed, professor of anesthesiology, is the paper's senior author. 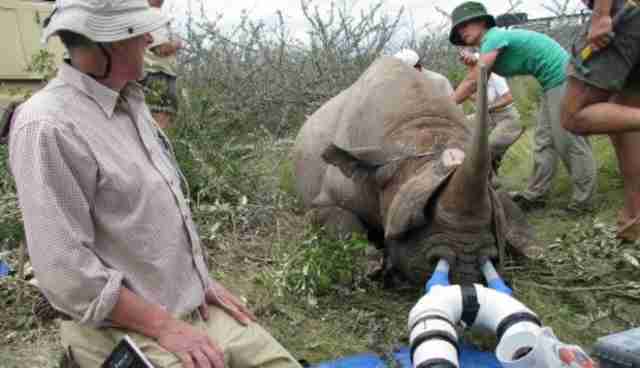 Wildlife veterinarians in the field with anesthetized black rhino. The veterinarians designed a system to collect and measure a rhino's breaths. Photo: Robin Radcliffe. 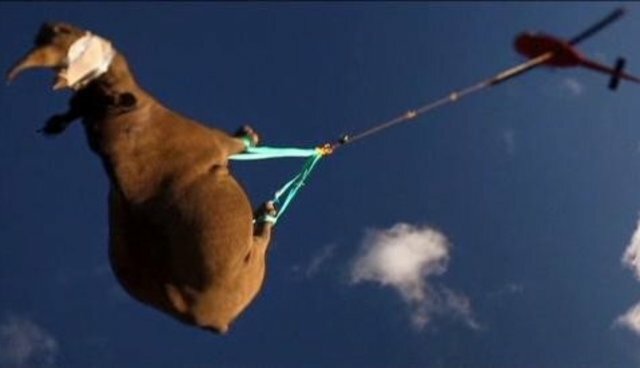 To capture rhinos, wildlife managers dart them from helicopters with a large dose of an opioid so the animal will fall down safely and quickly, minimizing injuries that can occur when they attempt to flee. The opioids are also reversible. This is important because "in the wild, you want to wake the rhino and make sure they are quickly up and mobile," so they don't fall victim to lions and other predators, Radcliffe said. Once anesthetized, wildlife veterinarians often lay the animals on their side because positioning them on their bellies can damage leg muscles. Researchers have also noticed that the rhinos breathe faster and deeper on their sides; a few previous studies had suggested rhinos breathe better on their bellies, but the effects of positioning on lung or heart systems had not been fully studied until now. In the new study, the researchers designed a system to collect and measure a rhino's breaths. The system involves cuffed tubes in each nostril, connected to PVC pipes and large collection bags to measure the volume of air moved with each breath (the so called tidal volume) and the total volume of air moved in a minute (minute ventilation). They also tested blood oxygen levels to determine how much oxygen passed into the blood with each breath. Though the rhinos appeared to breathe better on their sides, with larger amounts of air entering the lungs in this posture, the researchers found that much of this air was not taking part in carbon dioxide and oxygen exchange with the blood and so it was wasted. The researchers discovered that when rhinos are on their bellies, gas exchange is much more efficient and, as a consequence, the oxygen levels in the blood are much higher than when they are on their sides. Future research may address the effects of positioning during anesthesia on the cardiovascular system. Intentional management of rhinos is one of the best ways to ensure their survival; this includes moving them to protected areas away from poachers, reintroducing them to areas where they have been hunted, and relocating them to ensure genetic mixing, Radcliffe said. 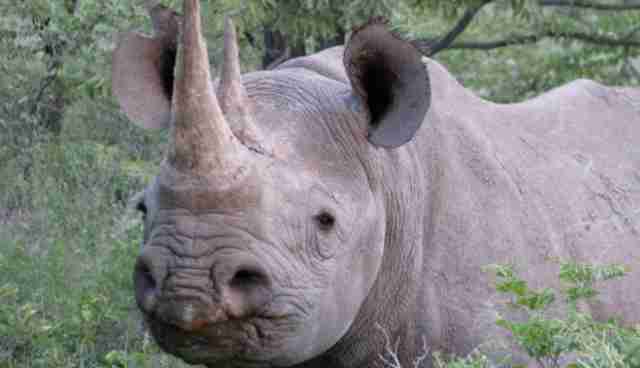 Poachers killed more than 1,000 black and white rhinos last year, and already more than 500 have been lost this year. The work was funded by the Morris Animal Foundation, along with generous support of Radcliffe and the Cornell Conservation Medicine Program provided by Kathy Ruttenberg. The researchers were invited by the Namibian Ministry of the Environment and Tourism to conduct the study.